Travelers make their way through 30th Street Station under the long-familiar flip board listing train departures. No one who rides Amtrak has to be told that a lot of the railroad’s infrastructure is very, very old. The tracks go back to the days of the Pennsylvania and New York Central Railroads, both founded in the 19th century. Many of Amtrak’s metal train cars were produced in the ’60s at the long-defunct Budd plant in North Philadelphia. In contrast, the mod information board at 30th Street Station is a relatively recent purchase, having been installed shortly after Amtrak came into existence in 1971. And yet Amtrak is determined to trash that spinning, clacking, pre-digital hearth — the last-surviving split-flap board left in its sprawling system — and replace it with a generic digital screen that will shower us with yet more blue light. In Amtrak’s shortsighted view, the split-flap screen is an embarrassing relic of the past and too much of a bother to maintain. The company assumes that having a big, energy-guzzling digital board will make it look more like the modern, first-class railroad it aspires to be. 30th Street Station’s flipboard is going away. Here’s what it looked like through the years. What Amtrak doesn’t seem to understand is that the hardy black-and-white information board is a certified design icon that is as important to its own history as 30th Street’s magnificent waiting room, with its colossal Corinthian columns, waterfalls of natural light, and regal, coffered ceiling. While the board obviously isn’t original to the 1927 design by Graham, Anderson, Probst & White, it has become an integral part of the ceremony of travel. 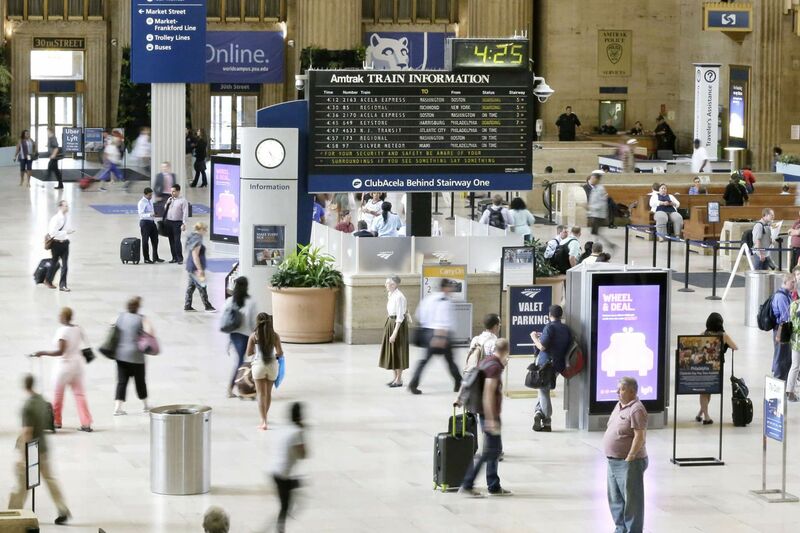 Even though you probably carry a screen in your pocket, chances are the first thing you do when you enter 30th Street Station is belly up to the information desk and scan the board. You wait for the satisfying clickety-clack of the flaps, which echo the clickety-clack of the trains as they race along the tracks. The mechanical board is the physical manifestation of motion. You are traveling even before you’ve left the station. Amtrak began installing split-flap information boards in its stations in the ’70s, a few years after the new national company (a conflation of America and Trak) was assembled from the bones of the country’s bankrupt private railroads. It was a time of enormous disruption in transportation. Rail travel was rapidly losing market share to automobiles and airports, and private railroads were eager to be freed of the obligation of running passenger trains, so they could concentrate on the more profitable freight service. Many Washington policymakers saw Amtrak as a stopgap measure. They assumed that train travel was dead, and that Amtrak would eventually wither away. But Amtrak’s management was determined to hold its own, William C. Vantuono, the editor of Railway Age, told me. At the time, he said, Amtrak’s network consisted of a “bunch of junk” that had been inherited from the private carriers. Yet the new company nevertheless embarked on a campaign to rebrand rail travel as modern and fun. Advertisements that ran on the first day of operation promised that its trains would be faster and more comfortable than the bus. This ad ran shortly after Amtrak took over the nation's intercity rail system in 1971 and presents rail travel in a new, more modern light. Amtrak gradually began making improvements to its stations, which had been left in a terrible state by their former owners. There had been so little investment that many stations still relied on chalkboards to list the arrivals and departures. Amtrak soon replaced them with a new technology developed by Italy’s Solari company, the split-flap board. Both modern and mod, the introduction of the Solari boards can be seen as an essential part of Amtrak’s origin story. Invented in 1956, Solari’s split-flap boards completely changed the way time is presented. Rather than hands moving around a dial, the spinning flaps show travel information at a glance in clear, easy-to-read, sans serif type. Hundreds of train stations and airports rushed to install the boards. The technology was later adapted for home use when Solari’s Gino Valle came up with an electromechanical flip clock, the Cifra 5. A version of that clock is now represented in the Museum of Modern Art’s industrial design collection. Vintage versions sell for hundreds of dollars. This Cifra5 clock was designed by Gino Valle for Solari Udine in the mid '50s, using the same technology used on information boards. It now sells for hundreds of dollars. The split-flap information board is also being recognized as a design icon. In 2013, a local competitor to Solari, Oat Foundry, established a factory in Bensalem and has been turning out split-flap boards for restaurants like Honeygrow, Momofuku, and Starbucks, which use them to update their menus. Even though the boards operate mechanically, they can be programmed from a laptop, just like a digital screen. The big advantage is that they consume a fraction of the electricity. It’s ironic that Amtrak decided to ditch its split-flap boards just as the technology was gaining a renewed appreciation. Amtrak spokesperson Jason Abrams said the company made the decision because boards were becoming “hard to maintain” and Solari no longer manufactures the parts (true). One by one, digital screens have taken the place of split-flaps in Boston, New York, Newark, and Baltimore. Only Philadelphia’s Solari board survives, but Abrams said it is scheduled to be removed in mid-January. Sean Rossiter, president of Oat Foundry, works on a split-flap style board at the company's facility in Bensalem. What will replace it isn’t clear. Newark’s board was built by Solari and offers a digital interpretation of the split-flap board, complete with sound effects. It’s a passable option. But the giant blue screen at New York’s Penn Station looks as if it were picked out by someone in procurement with no sense of aesthetics. It manages to make that horrible dungeon space even more depressing than it already was. It doesn’t have to be that way. Joseph DeCarlo, who runs Solari’s New York office, told me the company could rehab the existing board in Philadelphia for $100,000. That’s a mere fraction of the $11 million that Amtrak has budgeted for a new digital information system, which would include several small screens and a public-address system, in addition to the large digital board in the center of the station. The top image shows the new digital board in New York's Penn Station. A better design is the combination board installed in the Newark train station, which combines digital technology with the look of a flipboard. It’s understandable that Amtrak would want its schedule board to be integrated into a cloud-controlled information system. No problem. Oat Foundry’s Mark Kuhn said his Bensalem company (which is about to relocate to the Frankford Arsenal) could produce a digitally controlled split-flap board for well under $6 million. If Amtrak really insists on having digital screens, it can always install a few small ones near the platforms, although the standing variations it now has seem perfectly good. Amtrak already has digital signs next to the platforms announcing the scheduled trains. The argument for retaining the split-flap board isn’t mere nostalgia, like the current fad for record players and typewriters. Split-flap boards work just as well as digital screens, and their crisp letters are often easier to read than digital alternatives. That’s why the Milan train station, which is far busier than 30th Street, still uses a Solari board. Even that symbol of the jet age, the former TWA terminal designed by Eero Saarinen at New York’s Kennedy Airport, is getting a new split-flap board as part of its renovation. Solari USA is rebuilding the original mod split-flap departure board at the former TWA terminal at Kennedy Airport in New York. The survival of the split-flaps is a relief for weary travelers. Our environment has become so saturated with big screens that we hardly look at them anymore. The tracks and trains that Amtrak inherited at its inception have been refurbished and updated many times. So why not the information board? The story that the Philadelphia Daily News ran on May 1, 1971, after the first Amtrak train departed Philadelphia for New York. It ran on Page 4.